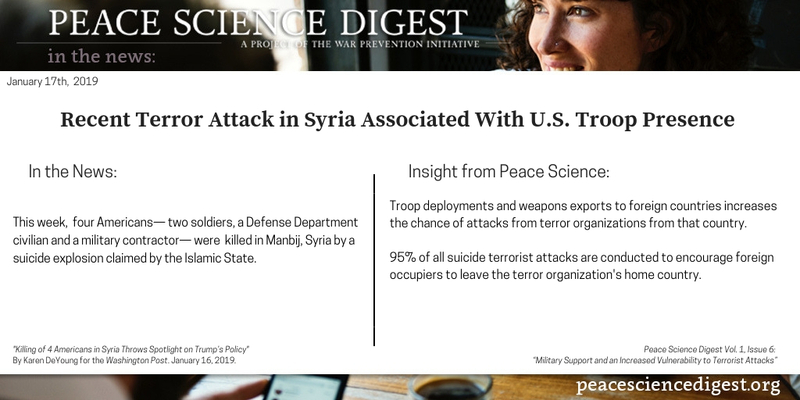 Foreign military presence increases the likelihood of terror attacks, especially suicide bombings like this week’s attack against U.S. troops in Syria. Weapons exports to another country increase the chance of attacks from terror organizations from that country. Considering the increased vulnerability of both deployed troops and citizens at home, governments should take this research into account when deciding whether to provide military support. Moreover, this research has the potential to shift narratives and action away from a militaristic response to terrorism, toward the proven nonviolent alternatives of non-military intervention. “Killing of 4 Americans in Syria Throws Spotlight on Trump’s Policy”By Karen DeYoung for the Washington Post. January 16, 2019.